Design and development of a responsive website built on the WordPress content management system. Belfast Bus Company is Northern Ireland’s largest privately owned coach provider and approached amigo. to redesign their old outdated website, with the growing trend of mobile browsing in mind. The website would also need to be built on a content management system to allow for management of events or tour bookings the company may provide. The key feature of the new website would be a prominent and easy way for users to request a quote by completing a form with all the relevant information required. Belfast Bus Company could then use the information entered by the user to provide an accurate quote as quickly as possible. 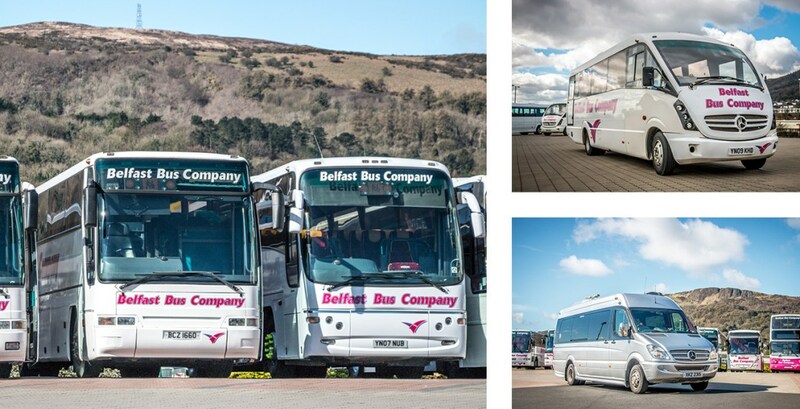 Belfast Bus Company are synonymous with their pink brand colour and logo, and this was kept in mind during the complete redesign of the website with the pink being used throughout for calls to action, headings and iconography. amigo. also provided photography services to help give the website a more professional and personalised feel, and help the website stand out against its competitors. The new Belfast Bus Company website caters of upwards of 1500 monthly visitors with roughly one-sixth of these making use of the new quote form to request a quote, with half of these using mobile devices to do so.